April is National Donate Life Month. Are you registered to be an organ donor? If not, now is the time to sign up. I understand why you may be hesitant. To be honest, just thinking about it creeps me out a little, but through my involvement with the National Kidney Foundation, I have realized that there really aren't any good reasons not to be an organ donor. I've heard the myths. Some of you are worried about doctors that won't save you if you're a donor. "They'll tear your organs out while you're still alive!" Perhaps you fear your heart will be needed in the afterlife so that it may be weighed against a feather before the jackal-headed Anubis. These and other myths are debunked at donatelife.net, a website that provides answers to all of your concerns. 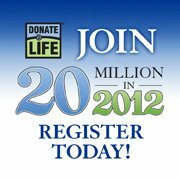 Register today at donatelife.net, signup at the Department of Motor Vehicles the next time you renew your license, and talk to your families about your wishes. 114,048 people are waiting for a life saving transplant. We should never say no to anything that may save or improve someone else's life. Thank you for taking the time to read this, and please pass this information along. First Round Fridays - Free Comedy at The Cove! Free Comedy at Far Fetched TONIGHT!